This morning, a great couple came over to get painted before going to work. The husband wanted to be a full-headed scary Jack O' Lantern, and the wife just wanted purple streaks in her hair. They came with their own orange, green, and purple hair spray, all prepared to go. He and his wife absolutely LOVED it! After I finished this, I did the purple streaks in his wife's very dark hair. Subtle, but cool. Well, he was so excited, and she was so impressed, that he convinced her to get painted too. She just wanted a cool eye mask, something with tribal. Her husband, on the other hand, went the opposite route. A man after my own heart, he got himself a black hooded robe and was looking for a skull face. His wife sat behind him on a chair as I painted, and then he turned around. She literally jumped, she was so startled by what I'd done. They decided they couldn't go visit his mother today, because it might do her in! Meanwhile, my pumpkin head emailed me, to tell me that the people at work were very surprised, and that security wouldn't let him in. He told them, " You know me man!! I've been coming here for years!!" A few of his co-workers got scared, and on the NYC bus it was hilarious. A few people spotted him on the bus and didn't want to get on! The bus driver was laughing so hard. He's been getting lots of stares and most people say, "Great job, who did it?" According to my client, "It's been so much fun man I haven't had this much fun in Halloween since 1998." I've received some new pieces of information regarding face paint safety. The first is the most recent MSDS sheet (dated 2008), from Snazaroo UK, the company that makes Snazaroo face painting products. It's located here. Ben Nye Makeup has been committed to the highest standards of product quality and safety for over 42 years. We adhere to responsible manufacturing procedures to meet the rigorous safety standards set by the U.S. Food and Drug Administration (FDA). Several reputable organizations and experts have issued opinions regarding lead in cosmetics. As the CTFA states below, lead is unavoidable. It is present in our environment, in foods that we eat and even in water that we drink. There is no conclusive evidence to confirm how much lead is actually absorbed through contact with cosmetics. Further, there is not one single recorded case in U.S. medical literature substantiating lead poisoning through cosmetic use (SNOPES, NOVEMBER 2008). It is impossible to live in a lead-free world. Lead is ubiquitous in the environment. It is in the air, water, soil, in short, it is unavoidable. However, compared to the amount of lead a person would ingest from eating and drinking ordinary foods, the amount expected from the use of cosmetics would be extremely small. Under the Food, Drug, and Cosmetic Act, the Food and Drug Administration (FDA) has the responsibility to take action if it finds a product to be unsafe and has abundant legal authority to do so. Cosmetics are safe products that millions of consumers use and enjoy every day. It is alarmist and irresponsible to suggest otherwise. Below are links to websites with useful information that specifically address and invalidate the concern that lead content in responsibly manufactured cosmetics are at hazardous levels. ... parents can enjoy Halloween festivities with their children without unnecessary worry about the safety of these novelty products. 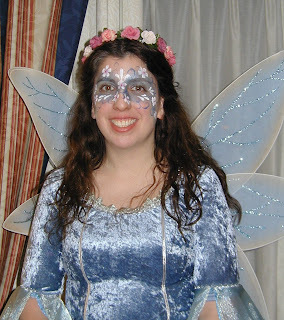 Although CSC is recommending to parents that they should mix up their own children's face paints, parents should note that since heavy metals are ubiquitous in food, water, air and other consumer products, there is no guarantee that homemade face paints are safer or as safe as those that may be purchased in stores. You can read the full text of his statement, which has even more information, here. You may have seen an article published by an alarmist activist group, "The Campaign for Safe Cosmetics," which has been cited at MSN Health & Fitness and even on NBC-2 News in Chicago. If you have seen this article, I'm sure it's raised questions for you, as well it should. It certainly raised questions for the face and body art community! Well, we're lucky. Snazaroo, one of the leaders in face paint production and the mainstay of my own body art kit, and one of the companies named by CSC, is produced in the U.K. but distributed in the United States by Gary Cole, owner of Snazaroo U.S.A, Inc. Mr. Cole, a face painter, body art instructor, and competition judge himself, who has had many years in the cosmetics industry before his ownership of Snazaroo U.S.A., Inc., makes himself accessible to body artists around the world and to the public itself via his Snazaroo-hosted Google discussion group, FacePaintHQ. When we as body artists got wind of this alarmist article, we went right to the source, and questioned Mr. Cole. Mr. Cole notes that the group from which the article comes is "The Daily Green - The Consumer's Guide to the Green Revolution," a group that has a political and financial stake in producing work such as this. Snazaroo offers you "The World's Safest and Easiest to Use Face Paint Brand." We still do. Our safety page ... goes well into the safety policies of Snazaroo.... If you go online ... you will find an MSDS (Material Safety Data Sheet) from Snazaroo in the UK. It is from testing of the face paints sent out to an independent lab called SGS. In the report, you will see that Snazaroo face paints are fully compliant with the cosmetic laws of the E.U. and the U.S. FDA. This particular test was done in 1995. You will also see that the metals levels are WELL BELOW the FDA requirements and found acceptable for use on the skin. In fact, the metals content reported could be sixty times its current level and still be within the cosmetic standards of the U.S.A. and E.U. It is safe as a cosmetic product. One might scoff that none of these ingredients are listed in the formulation. Well they are not included as ingredients in Snazaroo and therefore not listed. So where do they come from? They come as trace ingredients in the other ingredients formally listed. Most of the metals are coming from two specific colored pigments, black iron oxide and yellow iron oxide. These are natural ingredients used widely in the cosmetic industry. Because these come from natural ingredients, by nature, they have these minerals in very minor quantities. In the Snazaroo MSDS, you will see that the metals content from these trace elements are also compliant with the ASTM F963-95 which is the Standard Consumer Safety Standard that is specific to meet the Child Toy Safety rating. The bottom line here is ... Snazaroo has and still does lead the world in its quality and safety. No other brand can beat the safety of the Snazaroo brand. It remains the standard despite skeptics and their reports. He also spoke to a news reporter from NBC news in Chicago, who responded to his email regarding her comments about this story. She said she spoke to an officer at the FDA with regard to cosmetics regulations and they confirmed that the metal levels in Snazaroo were WELL WITHIN THE LEGAL REQUIREMENTS FOR THE U.S. COSMETIC INDUSTRY. She confirmed that Mr. Cole's email was very consistent with what they received from the FDA. She agreed the “Daily Green” report was "a lot to say about nothing." Snazaroo in the UK is also expected to issue a press release in response to the article in question, so expect a follow-up post from me detailing their statements. For some of my other supplies, also cited in the article, you can find the Mehron MSDS here and the Wolfe FX MSDS here. I am a scientist. Specifically, I am a physicist. I have taken many graduate classes in statistical analysis and can state that the sampling methodology [described in the article] is seriously deficient. This is not the first time I have seen poor analysis and sampling and it (unfortunately) will not be the last. I am grateful that some of us use common sense when considering reports like this. To say that the face paint contains lead is as informative as stating that it contains hydrogen and oxygen. So what? If you reread the article by CSC, please note that the group's real gripe seems to be with the FDA. They're not actually claiming that the face paints in question don't meet FDA standards; they're claiming that the FDA doesn't go far enough to regulate the cosmetics industry as a whole. Well, you can take that up with the FDA if you like, but the bottom line, very simply, is that professional cosmetic-grade face paints are perfectly safe for use on you and your kids. My husband and I went to a haunt in NYC, Blood Manor. It's a popular event, with a line on which we waited nearly two and a half hours. In the drizzle. And chill. Some, not so much so. There were also some rather truly gruesome "attractions" happening in the street, photos of which I will not post. Suffice it to say, the men who were having dollar bills stapled to their skin were not the worst of it. This event is not for kids. Inside, the walls were covered in UV-reactive paintings on black canvas, with blacklights lighting the way. The paintings were terrific. All of the elements of the haunt inside were great - the actors, the costumes, the makeup, the props (I want those props for my house! ), the various room themes, the use of UV-reactive paint and 3D glasses, the inventiveness of some of the themes. It was all the more odd to me, then, that I wasn't scared. I'm an easy audience, too. I'm very easily startled, and I do scare. I'll be afraid of a dark street or driving alone after watching The Grudge. So the lack of fright with this event was disappointing. My husband thinks it's based on the speed at which we were herded through, though I understand that the tour couldn't be too long or the line outside would be even less bearable. I'm not sorry we went, though. I did enjoy the various pieces of it all, and appreciated the work and expense that obviously went into it. On Sunday, I painted with my friend Emilie at the Bergen County Cabbage Night Festival at the McFaul Environmental Center, in Wyckoff. If you were there, I was the chick with the colorful hair streaks. We had a beautiful day for it, the first real weekend day in October with no rain and a reasonable temperature. The colors of the autumn leaves made for a terrific backdrop. We were working like speed demons, so I had time for very few photos. I managed a few, though. And this one loved the result of his request for "just webs and spiders on his cheeks." I had to get a photo of this next girl. I've done many rainbow butterflies in my day, but when I showed her the mirror, she looked and exclaimed, "Oh, I'm beautiful!" I told her, of course, that she already had been. This cutie let me be the first person ever to paint her, and let me match the colors of her outfit. I love when I get to do that. And I thought this pumpkin face was a cute request from this little girl. I love this event. The county hosts it every year, free to the public. In addition to our face painting, there's pumpkin painting, hot dogs & cider, music at a bandstand, colonial reenactment, and pony and hayrides. If you didn't make it this year, bring the kids on over next year, for sure! When is face paint not face paint? When is it dangerous even if it's not craft paint? When it's not FDA-compliant or used improperly! There's a good article in Monday's USA Today, that you can read here. It explains the allergic reactions - red rashes, etc. 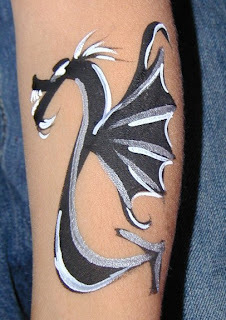 - that can result from using craft paint or face paint that's not the good stuff. Face paint, after all, is not all created equal. That stuff you get at most Halloween stores is usually from China. Remember all those issues we had a while back with products from China? The pet food? The paint used on children's toys? Yeah, same country, similar issues. The products I use are all labeled as makeup, not paint. So that's a start. If you're looking for face paints, look for makeup. Something to note: Face paint (as other cosmetics) are not FDA-approved. Under the law, the FDA does not approve cosmetics. What they approve is the pigments used in the cosmetics. This makes the makeup FDA-compliant, if one is being accurate. If someone tells you that the face paint he or she is using is FDA-approved, s/he's wrong. Now, I'm going to assume that anyone reading this is bright enough to never, never, never use craft paint on his face or the face of his child. That means no acrylics, no temperas, no watercolors, no markers, no Sharpies. Non-toxic doesn't cut it. As a good friend of mine in Minnesota likes to say, habanero peppers are non-toxic, but you wouldn't want to rub them all over your face! So... what about those Halloween kits you see at the stores this time of year? They're... potentially OK. But pay attention. If you buy a great-looking kit to do your son up as Darth Maul, and there's an awesome photo of just such a face on the packaging - read the entire package before you buy. If the label or packaging says to avoid the eye area with certain colors (like red or black, which is very common), listen to the packaging, no matter what the photo shows. The packaging and labeling trump the photography every time. Take it seriously. If the makeup smells funny, ditch it. Do not try to use it, since it could be infected with bacteria or simply old and past its shelf life. Your best bet? Hire a professional. Even if it's not me (there, now you know I'm not biased). Ask him or her what's being used. If you hear Snazaroo, Grimas, Paradise, Mehron, Fantasy WorldWide, or several other brands (do your research if you hear something unfamiliar), you're OK. If it's craft products, run. Run like the wind. Run like they're trying to give you the Swine Flu. And the same goes for face painters who won't tell you what they use. If they won't tell you, it's because they have something to hide. Yesterday was the middle school craft fair. It was... um... fun? Actually, it was slow. There wasn't a lot of traffic, and most of the kids were either on their way to soccer games or had just come from them. Apparently, soccer's a hot sport at this school. I do a great flaming soccer ball, but none of these kids came over to find out. 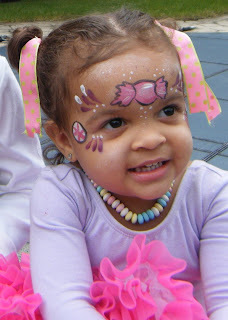 I did paint this beautiful little girl, who later came back for a glitter tattoo as well. That tiger was my only painting of the day; the rest of my few customers wanted glitter tattoos. She was so happy, though, and should've been a great advertisement! Today, after rehearsal for the community theater show I'll be in in November, I rushed to a birthday party in Cedar Grove, NJ to paint. The mom originally wanted a clown, but I wouldn't have had time to get into clown between the two obligations. Instead, I suggested a Hogwarts student, wherein I do my best Hermione Granger impersonation, completely with really bad fake British accent. Heck, I've got the hair for it. And the cloak, tie, scarf, and wand as well. The party was a first birthday for a boy with a huge family, and it was Halloween-themed. I was a hit, though I did feel bad that two boys thought I was a magician when I first arrived, one volunteering to let me saw him in half. I'm definitely going to start studying my magic books. This party was phenomenal. The food smelled amazing, the DJ had the party rocking, and halfway through my two hours a Uruguayan drum and dance troupe arrived to really liven the place up. I've never seen anything like it, certainly not at a first birthday. Most of the kids were in costume for the Halloween theme, as were some of the adults, but I was surprised most didn't want me to paint to match their costumes. They got all different faces. I did finally convince one wonderful little boy, who was very happy with the result, as was his mom. Young as he was, I have to say, he's the least squirmy canvas I've had in months! He was so good, and so patient, letting me work my "magic." One other boy had a funny idea: he wanted a syringe on his arm, with green fluid in it, labeled "Swine Flu." Funny. Well, once I heard that, I asked him to let me take some liberties, and asked if it was OK to use pink (since pigs are pink, after all). This very bright boy said, "Pink's fine. There really are no 'boy colors' and 'girl colors' anyway. They're just colors." Brilliant! I've been AWOL because a storm ten days ago sent a surge through our house. Luckily, my adapter sacrificed itself to save my laptop's life, so the whole machine wasn't fried. It has, though, made me realize I really, really need to back up my files. Really. Ever since, though, I've been waiting for a new adapter from Dell. It came at 7 p.m. tonight, much to my delight. And so I can finally tell you about last weekend. On Saturday, I painted at the church fair I mentioned in my last post. It was very nice, and the people there really were wonderful. I met some interesting characters, like a really sweet vendor, Francesca, who is a nurse and massage therapist, and for fairs makes knitted scarves and hats, as well as gazing balls, and chimes. Oh, and she also reads tarot. I'm not quite sure what she doesn't do! There was also an airbrush artist, from whom I plan to commission company shirts. I can't wait! But the fair was very, very small. It was, to be honest, the kind of venue I took on years ago when I first started painting. I took it this time to help out a friend, a fellow painter who took the space and then realized it was scheduled at the same time as a seminar she was attending. Business was slow. A woman selling her handmaid jewelry across from me took pity and got a glitter tattoo on her ankle, then rolled up her jeans to advertise it. Other vendors sent their kids over, sometimes more than once. So I did get to do some work. and he was ecstatic, running around showing everyone. On Sunday, I did painting and temporary tattoos at a 9th birthday party. This is my third year doing this young lady's birthday party! She's an awesome kid, and always has a great party with lots of family and friends, lots of activities planned, me, a bounce house, and a DJ. Come to think of it, I recognized the DJ from last year too. It's great to see a family with such vendor loyalty! I seriously feel like I should email my contact and ask if I should pencil them in for next year already. I love it when I hear from her each year. The theme this year was "Rock Star," and so the birthday girl got a pretty eye mask. Now this weekend, I'm painting on Saturday at the George G. White Middle School Craft Show, in Hillsdale, NJ. I'll be there from 9 a.m. to 4 p.m., so be sure to come visit! And on Sunday, I'm painting at a birthday party. I was contacted fairly last minute because the clown they'd hired bailed on them. So I'm dressing as Hermione Granger and stepping in as face painter extraordinaire. After the success of this past weekend and the Glen Rock Street Fair, I figure I should post about what's coming down the road. This Saturday, October 10, I'll be painting at a Craft/Boutique Fair at St. Clement Church, 154 Mt. Pleasant Avenue, Dover (Rockaway), NJ, from 9 a.m. to 4 p.m.
Then on Saturday, October 17, I'll be painting at the George G. White Middle School Craft Show at 120 Magnolia Avenue, Hillsdale, NJ, from 10 a.m. to 4 p.m.
And don't forget to make your appointment for custom Halloween face painting to match your costume! Hope I'll see you around. I'm tired and my back aches, but I had a great weekend. On Saturday, I painted at two birthday parties, both for two-year-old girls! The first was at a very nice home in Saddle River, NJ, with a Candyland theme. When I got there, only several adults, the birthday girl in an adorable fluffy hot pink skirt, and her older sister or cousin were there. I painted the two girls, the birthday girl as a candy princess. The second party was in New City, NY. The family there was huge, and again, both adults and children were ready for me. The mom who hired me had completely underestimated my popularity, thinking only kids would want to be painted. They were fun and high energy, and I ended up staying an extra hour to get everyone done. It was crazy! The birthday girl herself was adorable, and it kills me that I didn't get a good photo of her. Every time the flash went off, she blinked, so all I have are grainy photos with poor lighting. On Sunday, I painted at the Glen Rock Street Fair. It was my first time doing that fair, and it was an amazing day. I'd sent my husband home, and 45 minutes later I was asking him to come back to manage my line. I went nonstop for the five hours of the fair, painting furiously all day without a break for food or drink. I love it, though, the energy and the smiles! It was a hit with everyone, including the boy himself. This was also the first time I was ever asked for a snowy owl, of all things. The request was for cheek art besides! with blue and green bat glitter tattoos to match! Personally, I think she's going to grow up to be a model. She had such great camera presence! 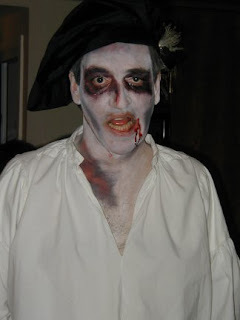 As a fan of Halloween, I start thinking about the holiday early, and it reminded me of a former Halloween. 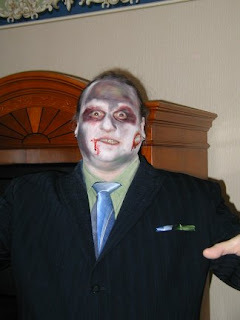 A few years ago, I was requested to create some zombies for an event called "Halloween in December." It was a multi-themed convention, running on the theory that you can never have enough Halloween. I'm inclined to agree. 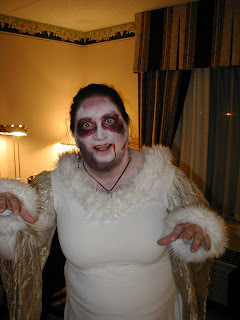 In fact, that year I attended FIVE Halloween events. It's worth noting that at that same event, I won "Best in Show" at the costume contest, not the least because I painted my own face to match my costume!